This article is about speculation and preparation for a Turkish military incursion into Syria. For the actual operation launched on August 24, 2016, see Operation Euphrates Shield. 6.1 Turkey to 'defend Aleppo'? Turkish military is shelling positions of the Kurdish militia for a second day running near the town of Azaz in northern Syria. Turkish military sources told Anadolu news agency that the shelling was continuing Sunday and several positions of YPG – the military wing of the Kurdish Democratic Union (PYD) - have been destroyed. The militias reportedly suffered a number of casualties, the sources added. According to pro-YPG Firat News Agency, the source of the shelling are howitzer at an outpost across the border at Yazıbağı village. Targets have been Maranaz, Mınıh, Manegh incl. airbase, Malikiye, Dahr Jamal and Tal Rıfat. On February 15, two children reportedly died and dozens of people were wounded in the ongoing shelling of Dahr Jamal. At least 2,000 Syrian rebel fighters have re-entered the country from Turkey over the last week to reinforce insurgents fending off an assault by Syrian Kurdish-led militias, rebel sources said today. "W‎e have urged Syrian Kurdish and other forces affiliated with the YPG not to take advantage of a confused situation by seizing new territory," Kirby said. ‎"We have also seen reports of artillery fire from the Turkish side of the border and urged Turkey to cease such fires.‎"
The shelling targeted the Menagh military air base and the nearby village of Maranaz, where “many civilians were wounded,” local journalist Barzan Iso told RT. He added that Kurdish forces and their allies among “the Syrian democratic forces” had taken control of the air base Thursday. Turkish armed forces began heavy artillery fire earlier Saturday, targeting Kurdish positions in what Turkish military officials called a "retaliation." The shelling also targeted Syrian forces, according to a military source quoted by RIA Novosti. The Turkish shelling of Kurdish positions continued for over three hours almost without a break, a Kurdish source told RT. The source added that the Turkish forces were using mortars and missiles and firing from the Turkish border not far from the city of Azaz in the Aleppo Governorate. "France is worried about the deteriorating situation in the region of Aleppo and the north of Syria. We call for the cessation of all bombardments, those of the regime and its allies on the entire territory and those of Turkey in the Kurdish zones," the statement said. Asked directly if Germany joins the French calls to Turkey to stop the bombing of the Syrian Kurds, the speaker of the German foreign ministry was unwilling to go beyond general statements "to all parties" calling for respect of the spirit of the deal made in Munich. 12 pickups with DShK and 14.5 mm machine guns mounted on them had their way from the Turkish land into Syrian territory across Bab al-Salameh border crossing. Speaking to reporters on his plane en route to Ukraine, Davutoğlu said YPG fighters would have seized control of Azaz and the town of Tal Rifaat further south had it not been for Turkish artillery shelling them over the weekend. "YPG elements were forced away from around Azaz. If they approach again they will see the harshest reaction. We will not allow Azaz to fall," Davutoğlu said. He said Turkey would make the Syrian Menagh air base "unusable" if the YPG does not withdraw from the area, which it seized from Syrian rebels. He warned the YPG not to move east of its Afrin region or west of the Euphrates River. 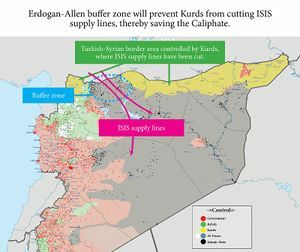 "Pushing ISIS away from the Turkish border, regardless of the semantic argument over whether it will be a buffer zone/safe zone/no-fly zone or “civilian haven” are all methods for achieving the same end. Any place along the Turkish-Syrian border put under the control of the NATO-Turkey-Saudi-Qatar Axis represented by Gen. Allen would act as a smuggling route transporting ISIS fighters, money and equipment into the country and oil or other resources out of the country." "What we want is to create a secure strip, including Azaz, 10km deep inside Syria and this zone should be free from clashes," Akdogan said in an interview on Turkey's AHaber television station, Reuters reports. "Turkey is not going to have a unilateral ground operation. We are asking coalition partners that there should be a ground operation. We are discussing this with allies," the official told reporters at a briefing in Istanbul, as cited by Reuters. "We want a ground operation. If there is a consensus, Turkey will take part. Without a ground operation, it is impossible to stop this war." Erdogan at November 2015 meeting: Greece got more than 400 bn euro during euro crisis. We should have invested some of that money into a safe zone in Syria, which would have solved all problems with refugees. And why they've failed to produce a stable Middle East (and probably won't this time, either). The most effective way to monitor the Azaz-Jarabulus border area would be to ensure that the Syrian side is filled by forces friendly to Turkey, or at least opposed to IS. One possible such group would be the Syrian Turkmens, who are ethnically related to Turks and are being trained by Turkey as a fighting force in northwestern Syria. 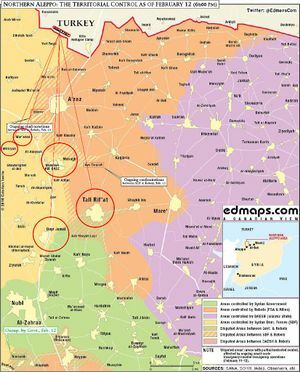 The zone, for its part, could serve multiple purposes, such as providing enhanced personal security for those fleeing barbaric Assad or IS rule, a staging area for anti-Assad forces, and an area for reducing the refugee flow into Turkey and then on to Europe. The idea of a Turkish-friendly zone would receive support in European countries already feeling overstressed by the Syrian refugee arrivals. Such an area would also interdict the movement of resources to IS, hence weakening the group, as well as allow Ankara to impede the movement of IS operatives into Turkey to target its economic resources, such as tourism. The area's creation would demonstrate to the Turkish people and allied countries that Ankara is serious about defeating IS even as it continues seeking stronger action against the Assad regime. In Russian coverage, 'new world war' was not used. He used language like 'permanent war', 'full scale', 'long term' war; 'a ground operation is an integration of all participants into this war' , 'do we really need another, third world shake-up to understand how much cooperation rather than confrontation is needed'. Operating under a NATO umbrella, the United States could use its naval and air assets in the region to establish a no-fly zone from Aleppo to the Turkish border and make clear that it will prevent the continued bombardment of civilians and refugees by any party, including the Russians. It could use the no-fly zone to keep open the corridor with Turkey and use its assets to resupply the city and internally displaced people in the region with humanitarian assistance. If the Russians and Syrians seek to prevent humanitarian protection and resupply of the city, they would face the military consequences. According to the general staff of the armed forces of the Syrian Arab Republic during the period from 7 to 10 February the Turkish military command moved to the Syrian border a total of 30 tanks, more than 20 self-propelled artillery guns and 30 field artillery guns of various calibers. This equipment and armament was secretly placed on the territory of Turkish military installations. So, up to 6 tanks were stationed on the Turkish border checkpoint "Chobambey" (photo 1) , 7 tanks at the border checkpoint near the town of Boz-Dag (photo 2) , and at firing positions at the border checkpoint near the town Arbash Dag 2 armored personnel carriers were found (photo 3). Saudi Arabia sends troops and fighter jets to military base in Turkey ahead of intervention against Isis in Syria, Independent, Feb 13, 2016. "Saudi Arabia visited the base for exploration. Saudi Arabia declared its determination against Daesh by saying that they were ready to send both jets and troops," said Çavuşoğlu, adding that they don't have a certain plan for a land operation. Turkey refused to allow a Russian observation flight over its territory in accordance with Open Skies Treaty. A Russian aircraft was to overfly Turkish border regions and NATO airbases. This incident which many media did not report is rumored to have stopped the Turkish land operation. Russian specialists had proposed a flight route which made it clear that the Russian General Staff knows very well what is being prepared, and that the Russian reaction will be extremely harsh. Ignatieff and Wieseltier are at least honest enough to acknowledge that they want to risk war with Russia. Some advocates for a “no-fly zone” in Syria try to deny that the risk exists. Fanatical interventionists that they are, the authors are not concerned about the risk of war with a nuclear-armed major power, and so they dismiss the dangers of their preferred course of action by saying, “risk is no excuse for doing nothing.” That’s insane. If the choice is between “doing nothing” and potentially starting a war with Russia, the risk that such a war would necessarily entail is an outstanding excuse. Avoiding an even larger, more destructive conflict with one of the world’s major powers is as good a reason for rejecting military intervention as one is likely to find. Russia has promised to protect Kurdish fighters in Syria in case of a ground offensive by Turkey, a move that would lead to a “big war,” the Syrian group’s envoy to Moscow said in an interview on Wednesday. A Turkish official speaking on anonymity told Reuters that Turkey had no plans for an incursion in Syria. “Turkey does not have any plans or thoughts of staging a military campaign or ground incursion in Syria,” a senior Turkish government official said. He did continue to blame Moscow however for an escalation in the Syrian war. Is "laughing at" the "propaganda" claim they were preparing an invasion; says it's Russia which is invading and responsible together with Assad for "400,000" people killed. The Turkish General Staff has two important considerations regarding the international community over sending troops to Syria. The first of these two is that the United States has not made any preparations for ground troops to be deployed to Syria, as it knows a United Nations decision cannot be met due to Russia’s stance in the civil war in Syria. The second was that the Turkish army would not set foot on Syrian soil without a U.N. Security Council resolution. At most, the Saudis are “offering” to participate in a ground war in which U.S. forces would be doing the vast majority of the fighting, and even then they would not be able to contribute very much to the effort. The Saudis are “inviting” the U.S. to put our soldiers at risk to advance their goals in Syria because they can’t do it for themselves and probably wouldn’t even if they could. This should make clear that all of the candidate pledges to orchestrate the creation of a Sunni Arab army to fight ISIS are nonsense. Syria hawks have to pretend that a ground war in Syria wouldn’t be fought primarily by U.S. forces, because once it becomes clear that this is what will be required their preferred policy will be rejected. Considering how unwilling the Saudis have been to commit large numbers of ground forces to their appalling war in Yemen, it was never credible that they would be willing to do more than that in Syria. The Saudis would fight under the control of the one brigade of the 101st airborne that was not announced to go for Mosul. The Saudis would deploy from Saudi Arabia likely via a U.S. controlled airstrip in west Iraq towards Syria while the brigade from the 101st would probably deploy from the Kurdish area in north Iraq through the Kurdish areas in north-east Syria towards Raqqa. Raqqa would thereby be attacked from a north-eastern and a south-eastern [direction]. The airport of Rumeilan/Abu Hajar would be one of the major supply bases. Dimitry Medvedev, Russia’s prime minister, was quoted telling Germany’s Handelsblatt daily: “The Americans and our Arab partners must think hard about this – do they want a permanent war? All sides must be forced to the negotiating table instead of sparking a new world war.” Medvedev was apparently responding to suggestions that Saudi Arabia and other Gulf states might join the US-led campaign against Islamic State in Syria. Earlier, the US defence secretary, Ashton Carter, tentatively welcomed the prospect of ground troops from Saudi Arabia, though in a modest role providing special forces or helping to train local forces, rather than the full-scale Islamic coalition to fight Isis, previously hinted at by Riyadh. Officials say they will wait to see if a planned ceasefire transpires and for a sign-off from the US-led coalition. 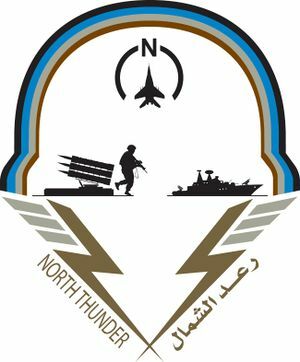 Saudi Arabia is witnessing the next few hours the arrival of troops participating in the largest and most important military exercise in the history of the region, "North Thunder". This exercise will be carried out in the King Khalid Military City Hafr al-Batin in the north of the kingdom. It is the largest military maneuver in terms of the number of countries, with the participation of 20 Arab, Islamic and friendly countries in addition to the Peninsula shield forces. These countries are: Saudi Arabia, United Arab Emirates, Jordan, Bahrain, Senegal, Sudan, Kuwait, Maldives, Morocco, Pakistan, Chad, Tunisia, Comoros, Djibouti, Oman, Qatar, Malaysia, Egypt, Mauritania, Mauritius in addition to the Peninsula shield forces. Saudi media said some 350,000 forces from the Persian Gulf Arab states and a number of other countries will take part in the Saudi-led military maneuver in the area of Hafer al-Batin in northern Saudi Arabia. Some 2,540 warplanes, 20,000 tanks and 460 helicopters will also participate in the exercise, dubbed “North Thunder.” In 18 days of maneuvers, the airspace over northern Saudi Arabia will be closed. He denied any link between North Thunder and the recent announcement by the Kingdom regarding ground military intervention in Syria, noting that these exercises were announced previously and are part of a defensive, not offensive, approach. Al-Marie revealed that Iran seeks control in Iraq for extremist Shiites who are loyal to Tehran, and not Baghdad. “We know that Iran has been trying to widen its footprint in Iraq through a so-called demographic occupation and emptying Iraq of Sunnis, either by displacing them or wiping them out, as well as by emptying the country of moderate Shiites loyal to Iraq,” he said. NATO has agreed to keep Spanish Patriot missile batteries in the southern province of Adana for another year to protect Turkey from potential threats from neighboring Syria. Stoltenberg recently said that NATO allies are seeking to send aircraft and command ships to Turkey in an attempt to boost the country's defense capabilities. The U.K. will provide aircraft to Turkey's İncirlik Air Base in Adana while Germany and Denmark will supply command ships to NATO forces in the Mediterranean. Spain is also providing Patriot missile batteries in southern Turkey. While NATO has increased air defenses for Turkey for many years, Turkey's downing of the Russian warplane that violated its airspace on Nov. 24 has drummed up NATO support. Russia may be preparing to send ground troops to Syria. The operation could take the form of a "peacekeeping operation" along the Turkish border. General of the Army Sergei Shoigu stated that in accordance to the order of the Supreme Commander-in-Chief of the Russian Armed Forces, forces of the Southern military district, separate formations of Airborne troops and military transport aviation have been put on “Full” combat alert since 5 a.m. The inspection is held at the Southwestern strategic direction. Moreover, aviation of the Aerospace Forces is to be redeployed at the alternate airfields. Looking through the site shows there are a lot of other activities in the Southern Military District since this order was given on Monday. This is clearly a warning to Turkey and a preparation for acting if Turkey doesn’t take the hint. My first thought was of course Russian Spetsnaz. But I asked around and none of my usual sources would confirm this. The sources acknowledged that the YPG in west Syria has special force support but there was some quite unexpected silence over who these forces were. It is clear to me that these are not Syrian special forces. The YPG does not want to be seen as a adjunct to the Syrian government. No one would confirm to me that these are Russian forces even as that would be of no great surprise to anyone. This leads me to speculate that some U.S. special forces are directing the YPG in the Azaz pocket. This in coordination with the Syrian army and the Russians. Washington says it does not believe the Kurds are coordinating directly with Moscow. But the YPG's advance may represent a masterstroke by Russia, which could benefit from any discord between NATO allies Turkey and the United States. "Now this is the YPG's dilemma: Will it continue with America or Russia? The consequences of this strategic choice will influence Syria's future, as well as the ongoing clashes in Turkey," said Metin Gurcan, an independent security analyst and retired Turkish military officer. The United States, which has supported the Kurdish fighters elsewhere in battle against Islamic State, has called for the YPG to stop actions that would heighten friction in northern Syria. It has also urged Ankara to stop shelling YPG positions. Washington has seen no evidence that the YPG are cooperating with the Russians, U.S. State Department spokesman Mark Toner said at a briefing this week. Pro-Erdogan media drums support for an invasion of Syria, but military experts say this is not feasible. Turkey’s shelling of Syria is a warning to the Kurds to stop trying to free the northern part of the country from Islamic State (IS, previously ISIS/ISIL), Kobane-based political analyst Barzan Iso told RT, citing reports of civilians injured in the attacks. Moved to Operation Euphrates Shield. This page was last edited on 26 August 2016, at 15:55.